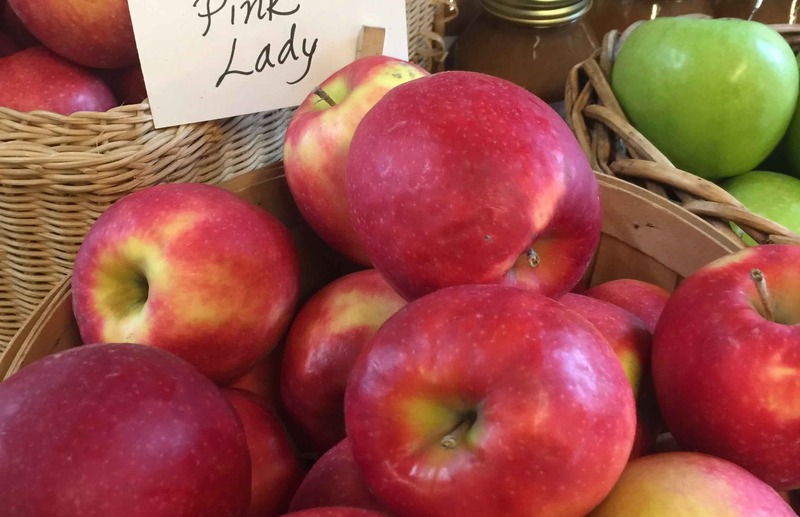 Nutritionist’s Pantry ~ Cozy Up To Fall with Apple Pie! I love this time of year! The clear, crisp days, colorful leaves and berry bushes, and the delicious fall produce that starts to arrive in our Farm Market. Apples are one of my fall favorites. A sliced apple with some local peanut butter from CB’s Nuts is one of my favorite seasonal snacks or breakfasts. Apples provide a hearty dose of fiber and vitamin C to keep our tummies and immune systems happy. They’re extremely versatile and pair very well with other local seasonal ingredients such as squash, sturdy fall greens, and whole grains. Speaking of whole grains, another one of my favorite recipes for fresh apples is hot apple pie with Lisa Crawford’s perfect whole grain pie crust and warming spices – hits the spot on chilly fall nights! In case you missed Lisa’s most recent pie class, here’s her stunning apple pie recipe with a lavender twist. Lisa will be back in the 21 Acres Kitchen teaching her pie magic in December. Check out the website for more details about all the classes we offer! In a bowl, combine the apples with the sugar, honey, lavender extract, salt and arrowroot. Toss well. Remove a disk of dough from the fridge. Lightly flour the counter and unwrap dough. The dough will be cold and difficult to roll so whack it a few times with your rolling pin. Once it gets a little more workable, roll out the dough and cut into a 12-inch circle. Place dough in pie pan and trim so only about 1/2-inch hangs over the edge of each pie pan. Fill pan with fruit. Roll out the remaining dough and center over the filling. Trim edges to match bottom crust. Crimp with fingers or fork. Cut vents in top and decorate with scraps of dough if you want to. Place the pie on a baking sheet. Brush top of pie with egg wash and sprinkle with sugar. Bake for 15 minutes at 425ºF, lower the heat to 350° F and continue baking for 20-30 minutes. The pie is done when the fruit is bubbling and the crust is golden brown. Lavender extract: Combine about 1 tablespoon dried lavender flowers and 3 tablespoons high quality vodka in a small glass jar, and shake, shake, shake. Keep in a cool, dark place overnight to allow the vodka to soak in the lavender flavor and fragrance. Strain out the lavender flowers before using. Sprinkle with fresh flowers if still available when serving.